ProTan are a long established tanning accelerator and bronzer brand, with high quality tan results so you really stand out from the crowd. With quick delivery on every order from Dennis Williams and Free delivery on every order over £50 ex.VAT, you can really afford to stock up on Pro Tan products for your tanning salon/services. Use a well known and respected product to help boost professional profits. Available in a range of different strengths and shades, such as Seriously Hot, Totally Baked, Incredibly Black and more. 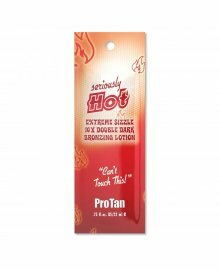 Try a tanning accelerator with the 22ml sachets or get the full 250ml bottles, we supply both. In addition, certain flavours are available in giant one gallon quantities.